I am such a good blogger with good blogger etiquette that when you ask for photos, I give you photos. Voila!! A day in Versailles apartment hunting. Perfect day, even if we had no luck, it was just so nice to be back together again. Now that I really, really live in France I get to have a new shiny pink French phone! Woohoo! Fresh croissants to break the fast. Heaven. Oh and fresh coffee too. Real coffee, none of that Nescafé shite that we drink back home. At Chateau de Versailles I sat down and took a rest because my feet were killing me and my new shoes were filling up with blood. 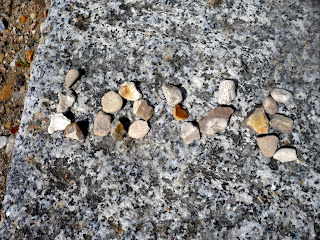 Then I just had the notion to write the word 'Love' with some pebbles and take a photo of it. So I did. Ca-razy. The building on the right is the Mairie de Versailles. The rest of the photo shows how big the roads are in Versailles. Love it. This is the front of the Marie. Impressive no? Again...um the Marie. Sorry these pictures are probably not atall interesting to the majority of you. The Cathédrale de Saint Louis. No photo can do this place justice. It's Gorg. When I saw this wee wifey cycling by I just had to take a photo. To me this is very French, very Versailles; a wee wifey riding along on a bike in front of Le Palais de Justice, the only thing missing was the baguette. On seeing this I nodded my head and said to myself, 'ah yes, I have arrived in France'. I LOVE blowing dandelions fairies!! FP doesn't like blowing dandelion fairies but I made him do it because I thought it would be cute / funny and it was. Nous! In some street in Versailles (Avenue de Paris if I remember correctly). 1. I have a phone almost exactly like yours. Or rather, i HAD a phone like it. it took a dive in the hot tub in Las Vegas. damn. and now will cost me mucho dinero to replace. but i [heart] it so i cough up the cash. be good to your phone! True love: doing something vaguely silly and unmanly and not only allowing your girlfriend to take a photo but letting her show the interweb. Awww! Fantastic. Nice little glimpse into your photo album. Let me just say that Micah's phone going into the hot tub was 50% my fault, so not only watch out for your own potential accidental behavior around your phone but also watch out for FP's! I really dig the architecture there and if I saw a wee wifey on a cycle going by the courthouse I'd probably snap a picture too. Or rather, I'd wish I carried a camera other than the little crappy one in my phone. Aww you are both so cute! I have no appreciation for Versailles at the moment however, as I am cramming for a history exam and need to learn about the infamous treaty. However it looks lovely! I have the mental image of your shoes filling up with blood now -- had to stare at the croissants to make it disappear! I haven't been to Versailles in... ages. What a bad French I am. No wonder I was sent to Canada! Mmmm yummy croissants. Thats made me hungry now! Micah much sympathy for loss of pretty pink phone - have been through similar and is not easy to get over! Will treat new shiny pink phone well, especially around toilets, sinks and baths, because won't be near any hot tubs unfortunately. :-( Also, if you and TD do ever find yourselves near Paris / Versailles do come say hello / bonjour, ok? If not I may cry. TD You are a pink phone murderer. Tsk tsk, terrible TD, just terrible! Hey look at you, you are even beginning to use Scottish words in your comments! 'if I saw a wee wifey on a cycle...' well done! Am fair proud of you! Zannie Need you to come visit soon. Lacking friends here. Get pennies! Meowy! Zhu Sorry, sorry. Was pretty nasty portrayal of smallish cut on back of heel. Shoes did not really fill up with blood. Exagerated a wee bit. Am drama queen! Apologies! Bonnie Ahhh another croissant lover? I adore them, can't get enough of them which is why have gone up a dress size :-( poo! Hello, just dropped in from 20 somethings - lovely pictures, I love Versailles, such a great place to be - lucky you! 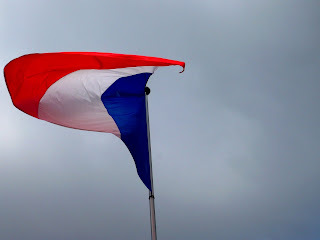 Oh such a 'French overloaded' post this one... I think I'll wear my blue beret and draw something nice like 'the end of the world' (wait a minute that is not a nice thing... hmmm...those manners of mine need some fine tuning it seems). Now, pouvez-vous me passer ces croissantes s'ils vous plait? (I just either "killed" the french language altogether or totally re-invented it for those emo-prone times we live in, LOL). Good to know you are having a great time in your new home Princess!!! Hello! I just found you on 'twentysomethingbloggers' and really, really like your site madame! Tres bon! Just came across this through Jane's blog, and I love it! The photos are fab, you've got me all excited about going to France for my much-anticipated year abroad the year after next through uni! So how's it going - you've been a bit quiet recently? !